To recap, the GT500 has a 5.2-liter, supercharged, cross-plane crank V8 that’s good for at least 700 horsepower. Rear-drive. That’ll all be hooked up to an all-new, Tremec, seven-speed, dual-clutch gearbox. Ford didn’t offer up specific HP, torque or pricing figures yet. 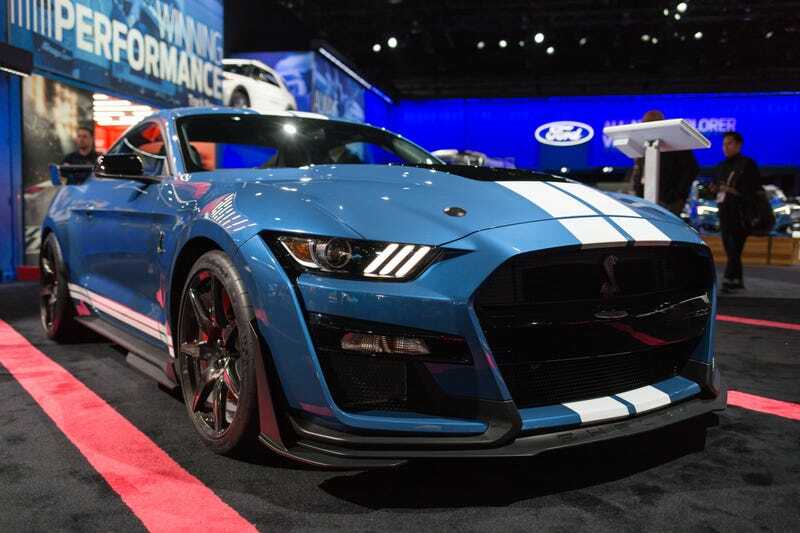 But GT500 will sit above the Shelby GT350, and that starts at around $60,000. You can probably ballpark from there. Unfortunately, we were not allowed to pop the hood at the show today, so we don’t yet know what the engine bay will look like. Regardless, here are the details. There’s no word of a manual option for the GT500 just yet, but mounted behind the steering wheel are magnesium shift paddles for a little extra driver engagement. They will probably feel better to pull than plastic ones. And they look cool. Is your Shelby Mustang even a Shelby Mustang without the cobra logo? You gotta have those life-affirming badges. Thankfully, the 2020 GT500 comes with the biggest Shelby logo ever offered. I didn’t have a ruler on me, so here it is with a Samsung Galaxy S7 next to it for scale. The splitter wickers with integrated dive planes on either side of the front bumper are totally removable, if you ever wanted to do it. A simple Allen wrench is all you need. They are another feature from the Carbon Fiber Track pack. A word of helpful advice: Don’t ever take them off. They look far too awesome. A tad redundant, but at least they look neat. The exposed carbon fiber wheels are also part of the Carbon Fiber Track pack. They come from the same company that manufactures the Ford GT’s wheels. At over 12 inches wide, they come wrapped in a set of Michelin Pilot Sport Cup 2 tires. Behind the wheels rests a set of Brembo brakes. Up front, the solid disc measures 16.5 inches—which is only about an inch off of the Lamborghini Urus’s 17.3-inch carbon-ceramic discs. A Ford spokesperson told me that after testing, Ford determined that solid brake discs yielded in the least amount of brake wear, so that’s what they went with. A big car with a big engine and big power means big noise. And what better to shoot that noise out into the world with than a set of quad, five-inch exhaust tips? I’m not sure if the picture does them justice, but these things are huge. They make me happy. Oh, and while we’re on the topic of those exhaust tips—see that gray trim riding along the top of the reflector? That’s there to protect the body of the car from being burned by the heat that comes out of the exhaust pipes. You ever see those poorly modded cars with the fat exhausts that leave burn marks all over the bumper? That piece of trim is there to prevent that. Is this the biggest hood vent that Ford’s ever offered on a production car? Quite possibly! And what’s also neat is that there is a removable rain tray sitting underneath it. So if you wanted to take it out to go tracking or something, you totally could. If you look at the swollen face of the GT500, the whole thing is basically a massive, gaping nostril, channeling air to feed the monster engine. Ford widened the grilles so that there’d be no overheating issues. Anyway, hopefully it will fare better than some other supercharged car I know that had, uh, some overheating issues. Adorning the rear of the GT500 is a wing that is both big and tall enough that it could double as a standing lunch counter. It’s all exposed carbon fiber and was taken from Ford’s Mustang GT4 race car. Obviously, it was modified a little bit to fit the street-legal GT500. But if you’re going to send over 700 horsepower to the rear wheels, then you’d better make sure they are pressed good and hard into the ground.